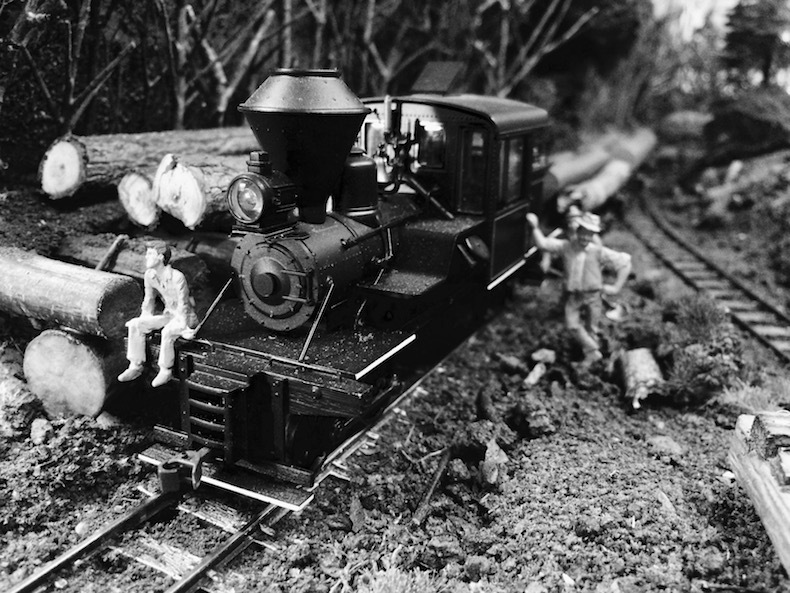 I am restarting the thread for the original Kittom Lumber Company, a backwoods logging railroad set in 1910 on the Kentucky/ Tennessee border. I will use the Photo hosting services of each of the fora I participate in and hope to help them financially as well. So, as with anything new there is a lot of hope. Let's pick up the story line and move some timber in the early epoch of steam logging. Here's a photo depicting the dense undergrowth and downfall near the logging landing on the original Kittom Logging Line. The underbrush needs to be removed as it is a fire hazard with all the steam engines nearby. You can easily figure who management is and who is going to do all the work. The underbrush is lichen from Scenic Express. It has been spray-painted with browns, grays and black. So those other forums that relied on Money bucket have just evaporated? I know we've had some problems with picture loading, that being aid, it is now working. The main reason I want people to upload their pictures here is that so many threads have had their pictures lost, they become threads with paragraphs describing nothing that can be seen. If our picture uploading goes down, at least we still have the pictures that were uploaded, and now with the new I.T. 's we have, anything broken should be fixed relatively fast. There are going to be many threads on many forums with no pictures as this ransomware continues. That is a strength of Zealot, that the photos were handled in house. Yep. Basically send them $400-$500 or kiss all your pictures bye bye. Folks are fuming all over the Internet. I am glad I saved my favorites (not construction threads though) and will print them on durable paper. This is a mini layout constructed of Blue Styrofoam. 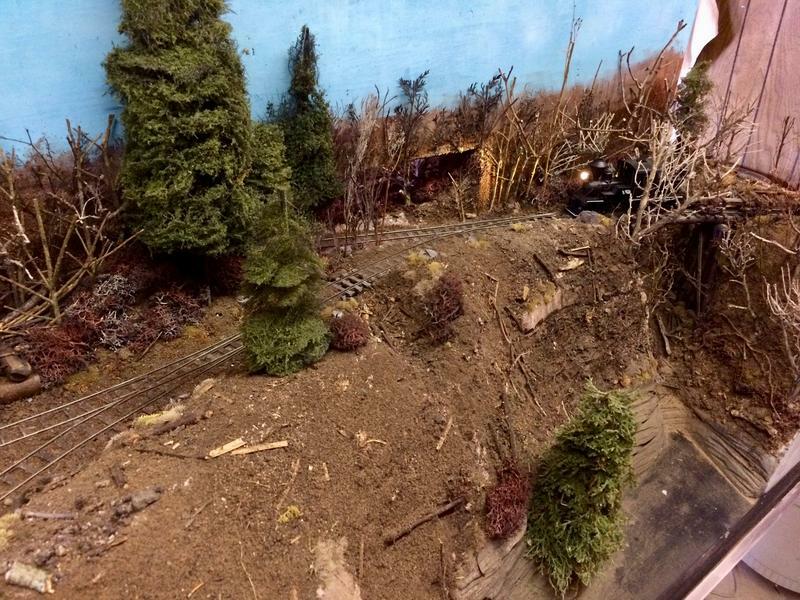 To make it look larger I used a divider between two scenes of the Railroad. To connect the two scenes I have placed a window in the scenery divider in the center. The scenes depict the road crew laying and spiking rail late into the evening. The individual trees had to be carefully placed and "pruned" to avoid fouling the engines and rollingstock. That is an impressive achievement. Your pictures always tell a story of building the track, showing the trains, and the life around it all. Not sure if was a compliment as much as an observation. It's not an easy task to pull that kind of story out, getting all the bits, and there are many, to fit together and look like they "happened" that way. There has been a lot of wind and rain here in Tennessee. This has resulted in a very good harvest of twigs. I pick them up on my morning walks and by nighttime they are fleshing out the winter forest I am trying to model. I have always liked this photo of a log landing in Oregon about 1925. This is a “colorized” version and for the life of me I have had a hard time locating the original B&W on the net. I have seen it before but cannot recall where. Anyways ,thought I would give a shot at a rough approximation of the action portrayed in the prototype scene. I realize that I have a Stearns Heisler (Climax in the original)posing up front and my little logging people do not appear quite as tired as the workers in the colorized picture. About one year ago I began this project in an attempt to model a primitive backwoods logging operation set in 1910. It looked like a blue foam aircraft carrier. There is much more to do including many more tree armatures, deadfall, leaves and then finally winterization with a little bit of snow and ice. This mini layout has kept me busy for a year and because of its small size allowed me to really detail the scenery. One of the BIG plusses of a mini layout. Thank you for looking and following along. P.S. I removed the vinyl photo backdrop from this side of the mini as it buckled and took my best shot at a painted backdrop. zathros and bigpetr like this. 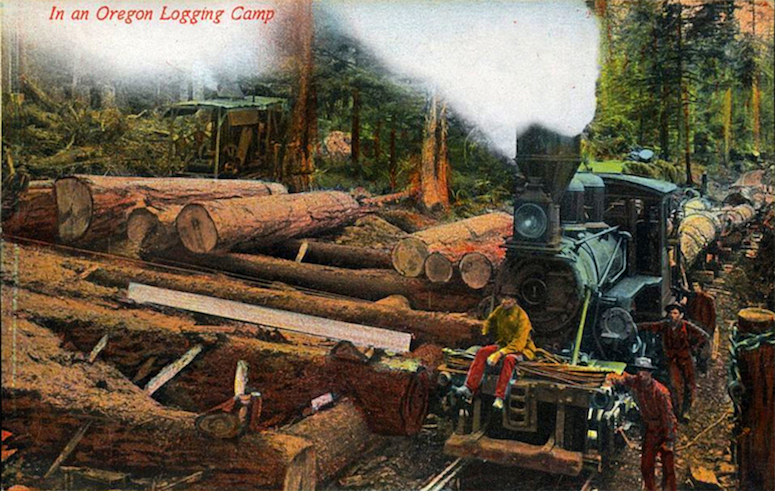 One thing I love about primitive logging railroads in the early 1900's was the absolute mess they functioned in. Dead fall and slash was everywhere and had to be a real hazard to the early loggers and their little steam trains. So as I advance the scenery on the mini layout I have been trying to recreate "the mess. "Cut up twigs and white glue were used to create the first layer of slash. Meanwhile Jethro and Bubba are still trying to figure out how to unload a log car by hand. They may be at it a while. Been doing a little more scenery work. The log dump got "dirted in". Thanks for the logs Bill. They are working out real nice. Lets call this one "Kentucky day dreaming". More layers of color and texture added to the mini layout. Amazing like allways . You have the eye and feel for this. I'm liking it! have some logs for you in my truck bed! Tom, are you going to the train club tomorrow, or can you come by the farm? It's Jennifer's Saturday to work, so likely we will be at the farm.